.............the abundance of spring flowers everywhere at the moment. ....................which in turn means the children spend all their waking hours in our little garden entertaining themselves, which therefore means a tidier, if much colder, house and dirty handprints over every surface. .................enjoying the peace and quiet of the post school drop off and washing the breakfast dishes. Particularly loving my red mixing jug, used every morning in the pancake ritual. .............changing the bed and relishing the anticipation of climbing into freshly pressed, line dried sheets, particularly this delicious new polka dot purchase from good old Dunelm Mill. ..........which goes perfectly with the new lightweight summer eiderdown. .............grabbing all those wrinkled tomatoes from the fridge and oven drying them on a low heat with thyme then bottling them with basil ready for the tomato tart later this week. ps. Forgot to say, thank you all for the fantastic comments about school, seems like I'm not the only one who has a bee in her bonnet about the starting age. I did enquire about starting Jack a year later but was told he would have to go in at Year 1 -does that make any sense?? Kit's actually a bit happier this week, we're looking forward to the Easter break so much. Jack sends a big thank you for all your lovely comments about his circus, he's thrilled. Good mummy has left the building, naggy old crone is back in town!! One of the greatest stress busters...............bed dancing. Guaranteed smiles all round! Children bring an unbelievable amount of joy into your life but boy do they make it guilt ridden and emotional at times. After a remarkably smooth transition into school life Kit suddenly started to cry every morning before going in and not wanting to leave me. I know, common sense tells me that how a child is one week will have no bearing on how they are the next but she was worrying us. Suddenly our happy, giggly little girl had become quite unhappy and clingy and wasn't really able to explain why. We think it's probably the realisation that full time school will be the reality for the foreseeable future, quite a lot for a four year old to take on board. I have a huge problem with the age we send our children to school in this country. Both my children are summer babies which makes them very young for their year groups. Whilst Jack has managed pretty well Kit seems very little amongst her class. I really think that four year olds are too young to begin full time education, I'd be more than happy to have had mine at home for another year. Almost all of the children in Kit's class are tired, emotional and grumpy, why are we doing this to them at four? Next, cornflake cakes for the school cake sale. Always a firm favourite and ones that I vividly remember making as a child. Mum would keep adding more and more cornflakes, we wouldn't believe that the chocolate would cover them but it always did. Of course we had to try the eggs, just to make sure they were edible. I'm glad to report that they passed with flying colours! meanwhile, conforming to the female stereotype perfectly Kit stays inside practicing her stitching............after helping Jack to waft the flames to life that is. At this point I feel should own up to yet another guilty pleasure.................ironing. Yes, you did hear me correctly, I do actually quite like ironing. Oops, said it again. Before I come over as all 1950's housewifeish let me confess that I'm totally crap at all other domestic duties but ironing I'm quite happy to do. I actually iron very few of our clothes so it only takes a couple of hours in the week, so it's on with the radio and I can happily drift away. And when it's something as delicious as Kit's bedding I'm quite content. Sunday morning means my regular car boot trip, the sun this weekend meant that it was huge and busier than I think I've ever seen it. It wasn't a particularly fruitful trip but I did manage to pick up this sweet little blanket which will be perfect for our camping trips later this year. 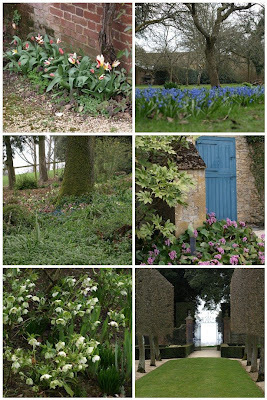 The afternoon brought a trip to one of our favourite NT haunts, Hidcote Manor, the most beautiful garden in nearby Broadway. As soon as we arrive the children are seized with the desperate urge to run in any direction. 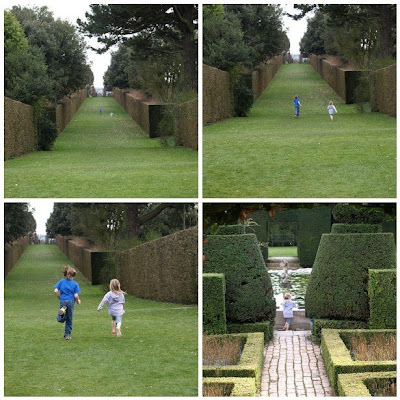 The gardens are set out in a series of rooms and are a delight to visit at any time of the year. Although it is always busy there's plenty of space and it never feels crowded. We followed our little guides on a very fast and furious trip around the different "rooms" loving their enthusiasm and delight at each discovery. Each time we visit, this long avenue just begs to be raced along and this time we weren't disappointed. Whilst we took a moment to catch our breath the two of them disappeared into the distance and then returned at a much slower pace. 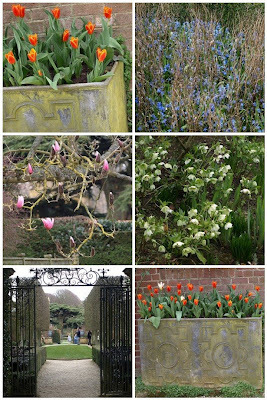 .................and we admired the gorgeous flowers, in particular the hellebores, tulips and primroses. ...............and we finished it all off with tea and chocolate cake in the cafe. Perfect, worth all the sleepless nights, anguish, guilt and mess that having children brings. Spending time with my little family is (mostly) the best thing of all. Before I go I have to mention this film. We watched it this weekend after seeing Kristin Scott Thomas nominated for an Oscar (or Bafta, can't remember) for it. It was superb, you have to see it! ...............another round cushion in the making, this time as a gift for mum, It was so fantastic to sit outside, listen to the birds and enjoy the sun on my face. Isn't it great to be outside again, the children are barefoot in the garden once more, filthy feet are the order of the day. ..........more of which are dotted around the house, courtesy of good old B&Q which had a great offer on. ............and of course, the hyacinths keep on going, this one is particularly fragrant. Did you notice that new mug up there?............yet another to add to my rather large collection, along with the Portmerion one I bought last week it's fast becoming a firm favourite, it's the perfect size for my cuppa. We had a girls only shopping trip to Bicester Village last weekend and of course the first stop had to be the Cath Kidston outlet store, from where said mug was purchased along with a couple of other goodies, including 3 metres of the most gorgeous dress fabric.........now all I need is a seamstress to run me up a tea dress. ..............what you can't see is the completely foul, cracked toilet with duck tape trying, and failing, to stop the drip, or the mouldy old shower cabinet. This picture makes me love my grubby old bathroom a little bit more, I've no choice really, it'll be another year before we can update it. A peek into Kit's room. 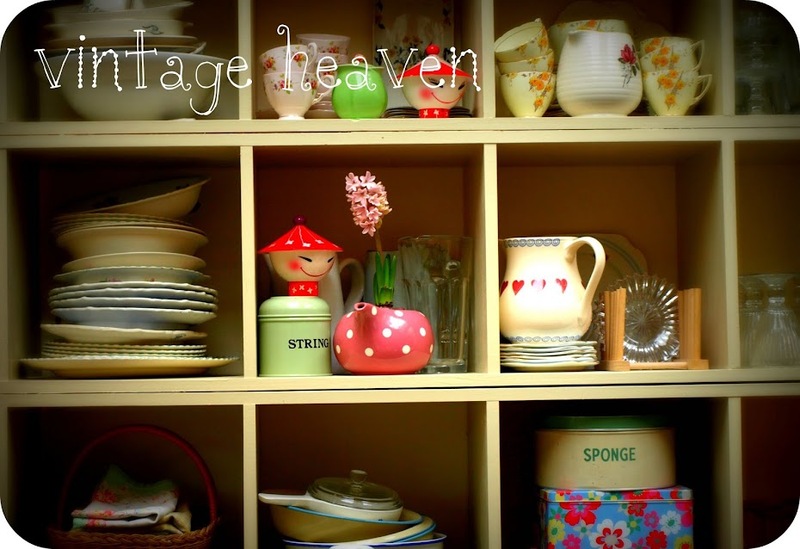 I like this "through the door" view, it means I can hide the mess behind said door, isn't blogland a wonderful, make believe place, you can pretend to have a lovely tidy home because nobody can see round the corners! So there you go, another post about not very much at all. I'm just pleased to have a tidy house, enjoying that clear brain feeling and kidding myself it'll last - hah! I give it three days at the most!